By Ellen DostalDo you hope that Stand-Off will change the way people see events like these? V: I hope it makes them a little more aware of what's currently going on. These issues are ongoing. They're not anachronistic. Everybody seems to think that we're all good now and that everything's fine; since the boarding schools aren't happening anymore. We're good but the situation is not. It's awkward because, the truth is, I don't think anyone specifically is a black cowboy hat-wearing bad guy; it's just priorities are different and entitlements come from very different places, and there is invariably going to be a clash. I read that you started a Native theatre company in the early 90s. Is that something you did to create more opportunities for Native Americans? Alas, I didn't think the play was that good. The majority of it was people saying or shouting talking points at each other. If you embedded that much conflict in, say, a novel, it might work. But as a 75-minute drama of nonstop harangues, no.Yeah theater isn't my thing either. It all pretty much feels like 75 minutes of people shouting at each other to me.I'm surprised that so many plays come out that way. You have the same amount of time as a TV show of 1-2 hours. But TV writers understand that you should build up to a few emotional moments--usually at the commercial breaks and at the end. 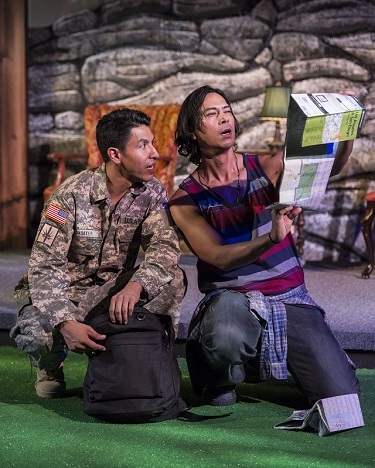 Playwrights think nonstop conflict is the way to go. Wrong.I'm not even sure it's the writing. I'm just annoyed by the ridiculous overacting. It's like stage actors don't know how to have a normal conversation or do dialog without waving their arms around and shouting everything.I'd blame this one on the writer and director. It's not like the actors were hamming up a few dialogue lines of conflict. They had no choice because most of the lines involved conflict. You'd have to double the play's length, at least, to add some natural "breathing space" between the lines.I can see where direction could be a problem too. Of course if it WAS written that way then nothing was going to save it.On the positive side, Stand-Off at HWY #37 presented a variety of modern-day Indians free of mistakes and stereotypes. It addressed a wealth of issues that never reach the mainstream media--that most Americans don't know about. It would take a few rewrites before I could recommend it. But the raw material of a good play is there. Below: Eagle Young as Private Thomas Lee Doxdater and Kalani Queypo as Darrin.